Barrett’s metaplasia (BM), also called Barrett’s esophagus, is a condition in which the normal squamous lining of the esophagus is replaced to variable extent by columnar epithelium containing intestinal-type goblet cells. It is generally believed to be a complication of chronic gastroesophageal reflux disease (GERD), with obesity, smoking, and alcohol considered contributing factors. 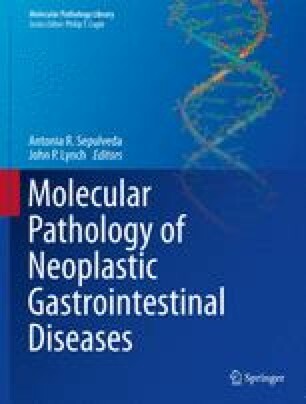 Persons with BM have a significantly increased risk for the development of esophageal adenocarcinoma that has been on the rise in the USA and Western Europe since the 1970s and is associated with poor survival. Early detection and surgical resection, when the tumor is still at an early stage, offer the best chance for survival. Understanding the molecular basis of this disease is essential to developing effective prevention and treatment strategies. In this chapter, we review the molecular changes that occur during the progression from normal squamous epithelium to BM and eventually to adenocarcinoma. We also discuss clinical relevance of some of the most common molecular markers.